The first book in JJ Sherwood's Steps of Power epic fantasy series. 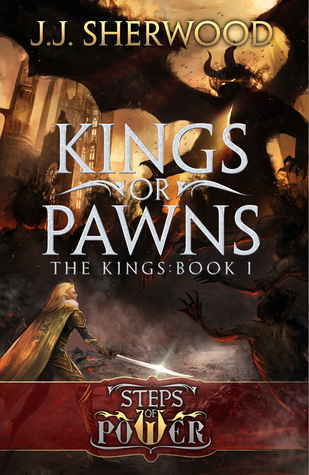 The Kings, Book I: Kings or Pawns is a political intrigue that spirals into an action and adventure series as the final events unfold. Here, everything was resilient. Here, everything had learned to survive. HOLY CRAP. New favourite fantasy book right here. This book surprised me in all the right ways. I honestly did not think I would have enjoyed such a politic-heavy book, but I LOVE this book. The world creation is amazing, the characters are fantastic, and great writing tops it off! This read is a fully fledged five star for me. The story focuses one, on the newly appointed King Hairem, who is thrust the responsibility of defending his country from notorious warlord Saebellus. Hairem is young, inexperienced, and unfortunately compassionate. As the new ruler of Elvorium, he discovers first hand just how complex its politics are, and truly how power and influence are divided among the influencers of the city. On the other side, we have General Jikun, who is hard headed but caring. He is brought forth from his homeland to fight for the royals as one of the best military combatants in the nation. He has his own demons to battle too though. While he is very different from Hairem, it is nice to see the parallels between the two. I absolutely adored the characters in this book. I fell in love with them before I even realized it! The struggles of each protagonist, their motives, and their feelings are all very well expressed. There are many characters in this book, which can be overwhelming, but the development of each character is done well enough that each character stands out in my mind. I hope to see more of the secondary characters later in the series. I've only recently finished this book, and my heart already longs to see these characters again. This book is very well written. The easy to read writing balances the heavy subject of the book. As well, there are perfect proportions of romance to action to comedy. I can't begin to imagine how much time and planning went into this book. The author is currently hosting a huge giveaway featuring autographed copies of the first two books in The Kings series as well as other fantasy themed goodies. There are also second, third, and runner up place prizes. Good luck!